Who hasn't partaken in the time-honored tradition of having breakfast at an IHOP or Waffle House after a night of carousing? It's a rite of passage. Alex Bowen of West Columbia, South Carolina had a special version of the rite last week when he cooked a meal in a Waffle House. It wasn't a prize and he wasn't training for a job. The 36-year-old dropped into his local Waffle House and stood around for 10 minutes without getting any help, he told ABC News. Undeterred in his quest for a late-night meal, he says he looked in the kitchen, found it empty, and decided to cook his own meal. Bowen documented his adventure in a series of hilarious selfies on Facebook. In the kitchen, he cooked up a "double Texas bacon cheesesteak melt with extra pickles." Though, in the midst of cooking, he managed to find someone who worked there. The employee was sleeping in a booth. Bowen says he let the Waffle House employee catch some Zs and finished cooking his meal. "When I was done," he told WISTV, "I cleaned the grill, collected my ill-gotten sandwich, and rolled on out." “[The employee] didn’t wake up the entire time. And no one came inside the restaurant,” Bowen told ABC News. Not only did Bowen clean up after himself, he came back later to pay for the sandwich. When he dropped in, an employee told him the store wasn't thrilled with his adventure, reports WISTV. "Yeah," Bowen responded. 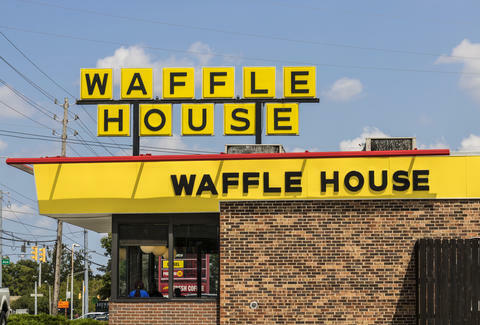 "[I] guess old Waffle House just gonna have to take the L on that one." After the story went viral, Bowen was contacted by a Waffle House manager who asked him to be a secret shopper and thanked him for pointing out "a flaw in their business." Overall, Waffle House didn't seem jovial about the situation. "For safety reasons, our customers should never have to go behind the counter," the company said in a statement provided to ABC. "Rather, they should get a quality experience delivered by friendly associates. We are reviewing this incident and will take appropriate disciplinary action. In a related note, obviously Alex has some cooking skills, and we’d like to talk to him about a job since we may have something for him." WISTV reports the sleeping employee was suspended for one week.